Speaking at the Library of Congress is a once-in-a-lifetime opportunity. For Regent University School of Business and Leadership (SBL) alumna, Dr. Eve Taylor ‘16, it’s another milestone in a life defined by Christ-driven purpose despite pain and sorrow. On November 1, she gave an address on her new book, Discover Your Why, to the Daniel A.P. Murray African American Cultural Association in the Library’s Madison Building. As a young woman, she was sexually abused. Although she was able to marry her childhood sweetheart, after having a daughter, doctors determined she would need to undergo a medical procedure that would keep her from having any more children. Their verdict severely impacted Taylor’s perception of herself and brought on a barrage of negative thoughts. She found herself in a low point — one of despair and self-doubt. The build-up of negativity and stress eventually cascaded, resulting in a heart attack. Furthermore, Taylor was rejected by her husband, and later, their marriage ended. She attempted to commit suicide, which in turn, brought about a revelation. She was watching evangelist Miles Monroe on television one Saturday morning. She recalled Monroe saying, “There’s somebody that’s been trying to kill yourself, and God has a purpose and plan in you, and wants you to live and not die. You cannot kill what God has created in you.” She knew he was referring to her. “I broke down and I wept,” said Taylor. It sparked a series of “why” questions, and she began asking the Lord why she’d gone through heartache and pain. This became the core message in Taylor’s recently released book, Discover Your Why. Taylor found identity with the story Abraham, God’s chosen father of the nations. Like Abraham, she’s seen her identity shift. The meaning attached to her name, she said, changed from one of “anger” and “bitterness,” to one attached to God, who gave her a “purpose and a plan,” for her life. 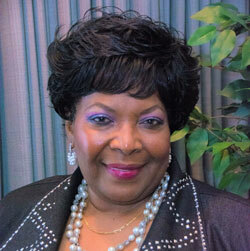 “God changed my identity, in a sense, and he changed my name to prosperity,” she added. She talked about the passage on Abraham in Genesis Chapter 12 during her address at the Library of Congress. The opportunity, Taylor said, stands as proof of God’s goodness and faithfulness in her life.